Paddlers begin the Giant Slalom Race (a.k.a. Smokin' Salmon Slalom Race) at the top of the Slide. Those who prefer not to run the Slide start at the jetty at the bottom of the Slide with an additional seven seconds assessed to their time. 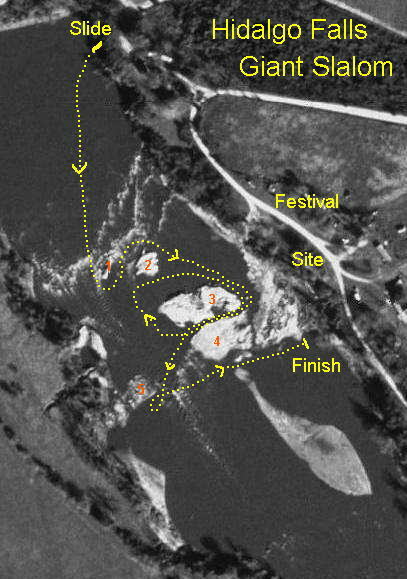 Racers then proceed downriver right of island #1, catch the eddy behind island #1, ferry across current above island #2, go down on the river left side of islands #2 and #3 (in front of the cheering festival crowds), cut through the slot between islands #3 and #4, paddle back up alongside island #3 out into the current into the eddies created by islands #1 and #2, cross the current above island #3 and back down again the left side of island #3 and through the slot between islands #3 and #4 (thus circling island #3). Upon exiting the slot racers cross the current into the eddy behind the penisula on river right (#5), turn in the eddy and cut back across the current (through the big tail waves at the bottom of the rapid) and head for the finish near the lower access trail. There paddlers have to hit a bell (with hands or paddle) to complete the race.